On my drive to see the Oscar nominated film La La Land last Friday, I read a bumper sticker, “Speak your mind even if your voice shakes.” As a speech pathologist, my natural inclination was to think about clients with whom I have had the pleasure of working with over the years. The ones who have engaged in long hours of treatment to remediate “shaky” or “quivering” symptoms in their voice as a result of an acquired communication disorder such as aphasia, dysarthria, Parkinson’s, neurogenic stuttering and spasmodic dysphonia just to name a few. Without knowing much about the quote or its author, I assumed it had less to do with living with a communication impairment and more to do with voicing your beliefs about social justice and equal opportunity. So, I became inspired to learn more about the quote and its author, Maggie Kuhn. If Maggie Kuhn were alive today to witness the estimated 4 million people worldwide marching in the spirit of human rights, I believe she would agree her legacy continues today. If you are affected by a communication disorder, fear public speaking or experience moments of trepidation speaking an opinion or belief deemed to be risky, please remember Your Voice Has Value. 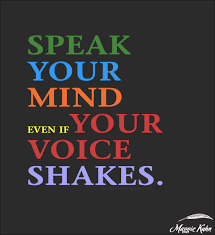 Though easy in theory, but oftentimes difficult in practice, speak your mind even if your voice shakes.